The church tent in Egypt that belonged to the congregation of Christian priest Fr. Jonathan Adel is pictured as it burns on May 12, 2016. A Christian church in Egypt was just torched to the ground at the hands of "extremists" on May 12. A video shows the structure burning as Christians scurry to throw pails of water on it. The church consisted of a large tent that had been consecrated and contained all the material of a "normal" church — an altar, icons, and crosses — and was led by Fr. Jonathan Adel. The Christians of the region had been meeting there for all regular church services, functions, and celebrations; authorities had agreed to its existence and use as a church. A statement condemning this attack, written by Bishop Macarious, closed with: "May God protect the Church and preserve Egypt and Egyptians from all adversity." Why were these Christians meeting in a large "church tent" in the first place? Because the church they had built in 2009 was sealed off by authorities after local Muslims protested and rioted. The Virgin Mary Church is not the first congregation in Egypt to be denied a church building, forced to worship in a tent, often to be attacked again. According to a 2010 report, "Since March 16, 2010, after the demolition of the old church [as in Minya], the Bishop and the congregation have been celebrating mass in a linen tent erected on the courtyard where the new church is planned, under the summer heat exceeding 113 degrees Fahrenheit." After waiting 44 years, the Christians of Nag Shenouda were issued the necessary permits to build a church. 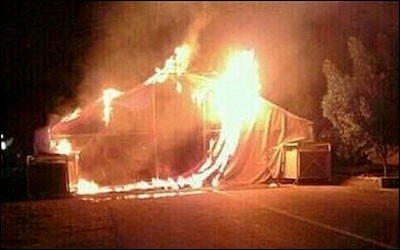 Because of this, local Muslims rioted and burned down the church tent they had been using. Then, when a Christian allowed some of the congregation to use his home, a Muslim mob attacked it. Denied a place to worship, the determined Christians of Nag Shenouda celebrated Easter 2015 in the middle of the street. Church closures and mob attacks on Christians occur across the Islamic world. Sometimes when the mob does not torch the church tents, the authorities do it themselves: Egyptian police destroyed the tent structure of St. Joseph Church, in another village in Minya, under the pretext that it was built without a license. Kenya (November, 2015): After rioting Muslims burned down two church buildings, the congregations were forced to erect church tents, some of which were flooded by strong rains, which carried away five people. Indonesia (January 2015): Authorities in the Sharia-governed province of Aceh began to remove tents built by Christians for worship after their churches were torn down by authorities responding to Muslim violence against churches that left one dead and thousands Christians displaced. At least two church tents were torn down. Earlier, in 2012, the St. Johannes Baptista church tent was sealed off by authorities. The congregation had been using it since 2006 as a temporary location, as they had not received a church permit since they applied in 2000. Sudan (June 2014): After authorities in North Khartoum demolished another church building that had stood since 1983, the pastor said "We will have to pray in a makeshift tent [along the road] next Sunday." Pakistan (September 2012): Soon after a madrassa (Islamic school) was opened near where churchless Christians held their tent services, Muslim students began harassing the Christians. They shot bullets at their homes, shouted, "convert to Islam or leave this neighborhood," and sexually harassed Christian girls as they left after services.